An "anarchical" no man's land, complete with garbage sculptures and a hobo-run "Landfillian Library." Certain places exist in a kind of urban vacuum. They decay, change and grow without the approval of authorities, and without blueprints. These places are often the domain of society’s marginalized, places where the homeless, bored teenagers, and those who simply wish to play and create without oversight can congregate. A collection of 20th-century automata, penny arcade games, and musical contraptions. A hotel and restaurant serving as the mecca of kitsch. The "3rd largest" city in California is an empty mirage of suburbia in the middle of nowhere. The Albany Bulb (aka The Bulb) is one of these places. 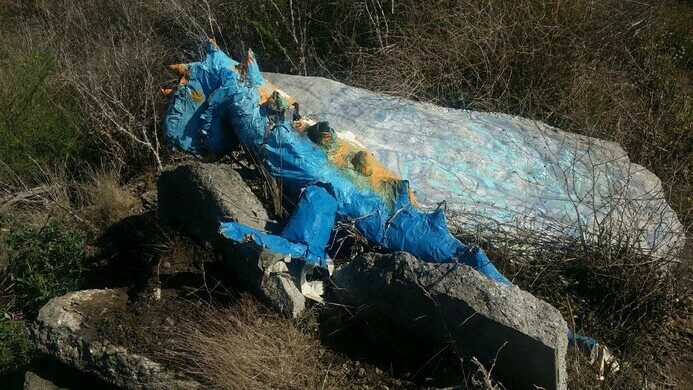 If you asked the city officials, they would tell you it is a landfill located on a thin strip of wetland in Albany, California, which extends into the southeast San Francisco Bay. If you asked the people who frequent it, you would get a different answer altogether. Created in 1963 as a dump for construction materials, it was closed in 1987 after a series of lawsuits and left in legal limbo. The size and inaccessibility of the park made it difficult for the police to patrol – and a perfect location for those looking not to be patrolled. Due to this, the Bulb has a reputation as an anarchic no-mans land, especially at night. Among those who have claimed the park are the homeless, who have set up small shantytowns; teenagers, who want a place to party; dog owners, who want to let their pets run wild; graffiti artists, who want to paint in peace; and environmentalists, who want to see the park returned to its natural habitat, and resent the dog-walkers and graffiti artists for helping to ruin the habitat. 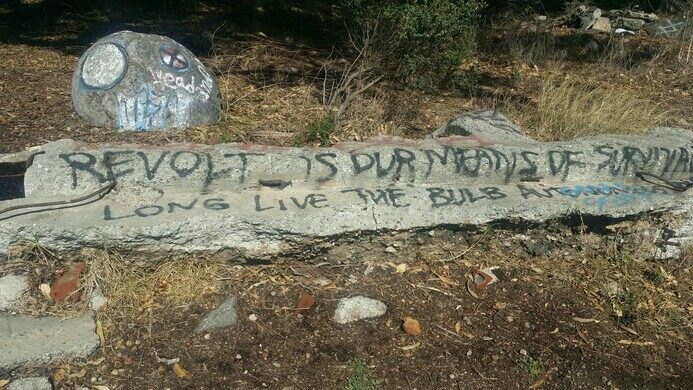 However, the Bulb is most distinctive for the contributions of its artists, both graffiti and sculptural, to the park. 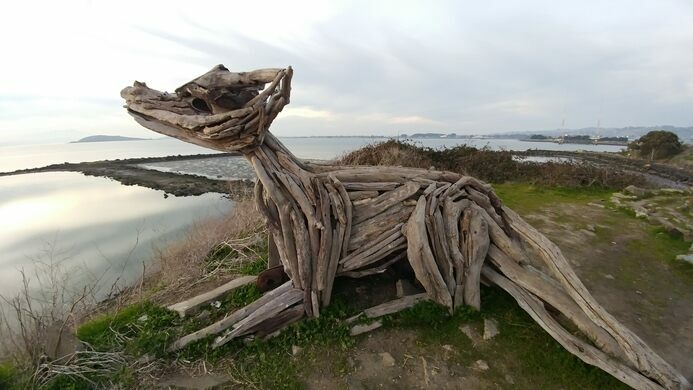 Among the more notable pieces are a series of large driftwood sculptures made by Scott Hewitt, Scott Meadows and David Ryan; a concrete TV; dragon sculpture; and something known as “The Castle”, which is a eroding concrete shelter covered in graffiti. The Bulb once contained a makeshift “Landfillian Library” assembled by Jimbow the Hobow. Comprised of roughly 300 books donated to “head librarian” Jimbow, the books were not only free to borrow, but free to keep. According to Wikipedia, the library burned to the ground in January 2014. The future of the Bulb is uncertain, with possible plans to turn it into an official park, or shopping area. In the meantime, the Bulb continues to operate under its own unplanned plans. 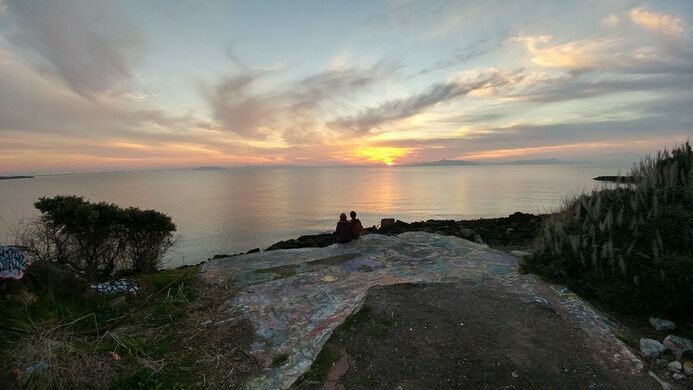 The Albany Bulb sits between The Eastshore State Park, and the east San Francisco Bay. Directly south east of The Bulb sits Golden Gate Fields, the only commercial race track in the Bay Area. The city of Albany lies directly to the east. 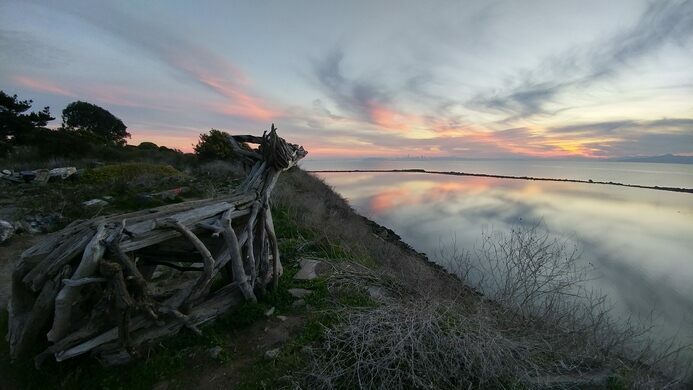 The Bulb, like the Eastshore State Park, is an estuarial habitat. It houses geese, ducks, and various birds, as well as reptile populations, and small mammals such as rats, mice, and rabbits. The Albany Waterfront Coalition, a group focused on the conservation of The Bulb, have stated that The Bulb is a Burrowing Owl habitat, but no official sightings have been made. Vegetation on The Bulb is typical of wetland ecosystems, but includes palm trees and blackberry bushes not native to the East Bay Area. A 90-acre park on former landfill that hosts an annual kite festival. A playground built by the kids that is a child's wonderland, and a helicopter parent's nightmare. An amazing collection of fantastic reptiles, amphibians, spiders, and insects. A pier that used to act as a busy ferry dock is now a decaying favorite of local fisherman and urban artists. This oceanside Reykjavik spot is speckled with recycled sculptures and large stones. A quirky collection of outsider art made from automobile parts. 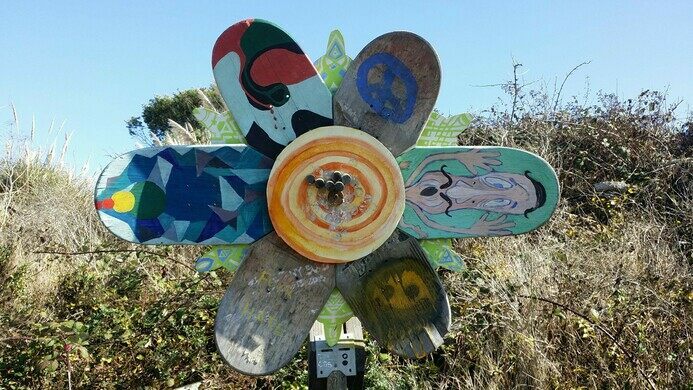 A father's love for his son has weathered the test of time in this whimsical garden of outsider art. This former industrial site has transformed into a community sculpture garden that hosts monthly Full Moon parties.